At the age of 7, Steve began playing clarinet in his hometown of York, Pennsylvania. While attending high school in Ft. Lauderdale, Florida, he passed an audition for the US Naval School of Music, but at the age of 16 was too young for military service. Later that year Steve was invited to play bari sax in a “big band” featured on Ted Mack’s Original Amateur Hour. As a senior, he passed an audition for the Air Force Music Program, enlisted after graduation and was stationed at Patrick AFB in Cocoa Beach, Florida. Five years later Steve joined the USAF Academy Band where he remained for the last 16 years of his Air Force career as a member of the Falconaires. Steve has had the privilege of playing with Smokey Robinson and the Miracles, Cat Anderson, Clark Terry, Red Skelton, Sammy Davis Jr., The Temptations, The Four Freshmen, The Diamonds and the Jimmy Dorsey Orchestra. On the local scene with the Springs Contemporary Jazz Big Band, Al Eberhardt, Frank Fanelli, Dwight Shaw, Bill Finch, Bill Emery and The Little London Winds. He has been called upon to perform in special programs at New Life Church, First Presbyterian Church, First United Methodist Church, Broadmoor Community Church, Bethany Lutheran Church, and the Tri Lakes Music Association. Steve enjoys being involved with the music mentoring programs of PPJASS and The Little London Winds, connecting with students from local elementary, middle and high schools. 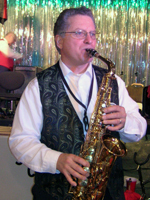 Steve is the leader of one of Colorado’s premier dance bands, the Swing Connection Dance Orchestra, of which he has been a member for 45 years. He and his wife Chris have been married for 11 years, continue to be active in church activities, have three children and five grand children. His hobbies include fishing, hunting and welding. Who’s your favorite composer and why? Scott Joplin--I'm a ragtime music fan! Do you like to sing in the shower, and if so, what is your favorite song to sing?